UNIT 701! OPEN 4/6-13 ONLY $1392 TOTAL! BOOK ONLINE AND SAVE! This new and upscale condo is just what you have been looking for. You can relax on the beach, dine on your private balcony, take a swim in the indoor heated pool, or relax in the hot tubs. This unit is on the 7th floor of Majestic Beach Towers... Tower II. This condo is the perfect place to forget your cares and unwind. Directly on the "World's Most Beautiful Beaches" facing the Gulf of Mexico, this brand new family resort in Panama City Beach, Florida, is the ideal vacation destination. This upscale development includes a gulf-front pool, indoor pool, fitness center, indoor spa, and much more. The condo is in a prime location, on the 7th floor. The living room is equipped with a 37" TV. There is also a DVD Player for your enjoyment. There are 2 full bedrooms a bunk area with 2 private baths. The Master Bedroom has a King-Size bed and 27 inch TV. The Second Bedroom features a Queen Size Bed and 27 inch TV. Both Bathrooms are marble. The Master Bath features a jetted tub and glassed in shower. The second bathroom houses a combination tub/shower. The kitchen is equipped with dinnerware to serve 10. The condo also has a coffeemaker, toaster, blender, and pots and pans for your convenience. The Dining Area has a Table with Seating for 6. There is a Bar Area in the Kitchen with 3 Bar Stools. A wet bar is also available in the Dining Area. 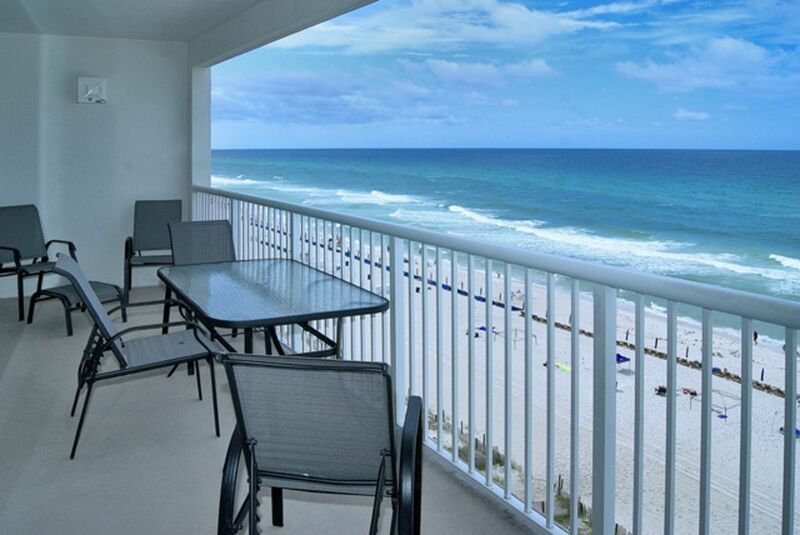 The unit offers a breathtaking view of the Beach and Gulf. Majestic Towers also offers the Majestic Market which features, Starbucks Coffee, fresh breakfast pastries and muffins, gourmet sandwiches, tossed salads, and pantry items and snacks and souvenirs. Hours are 7am to 7pm. There is so much to do in Panama City Beach. Between Shipwreck Island Water Park, Gulf World Marine Park, Ripley's Believe It or Not!, Ebro Greyhound Racing, and Zoo World. Also there are endless trails of mini-putt golf, boating, fishing, water-sports galore, lots of shopping, restaurants, and seafood festivals. It's a great place to just do nothing at all. Panama City boasts "The Beach Lover's Beach". The development of all the new resorts brings in upscale dining, shopping, and golf. This family-oriented, brand new complex is the perfect spot for your next vacation!